Soft mousse cake with layers of Vanilla crème Brulee and hazelnut chocolate, coated with crunchy chocolate spray for a perfect finish. Buy Made-To-Order Intensive Red Velvet Cake Online. Embodying a combination of velvety mousse and appealing red velvet texture, the intensive red velvet cake in the exclusive range of cakes at Smoor is the perfect recipe for birthdays, anniversaries and every special occasion. Our talented confectioners specialize in creating masterpieces, just the sight of which ensure smiles on your loved ones’ faces. With easy order process and dedicated delivery system, you can order red velvet cake online for the best price in India on our website, worry free. 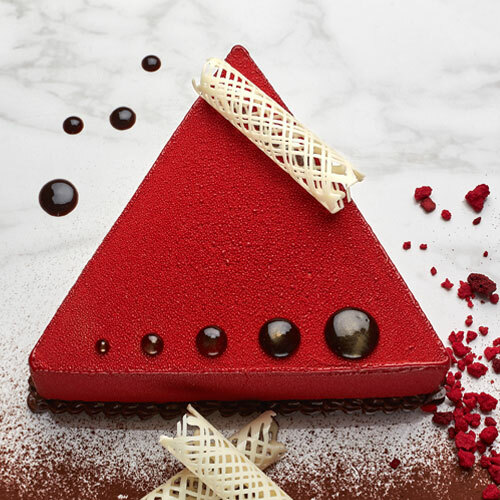 The intensive red velvet cake at Smoor is a treat of varying textures featuring a soft mousse cake with layers of Vanilla crème Brulee and hazelnut chocolate, coated with crunchy chocolate spray for a perfect finish. If you are on a quest to figure out the best cake shops in Bangalore, Smoor is your ultimate answer. Buy intensive red velvet cake online freshly baked to perfection, with our online cake shop for delivery across Bangalore.